Facebook CEO and Aaron Sorkin muse Mark Zuckerberg has said that because the “iPad isn’t mobile,” Facebook won’t follow up the success of its iPhone and iPod touch app with an iPad version any time soon. Thus, when I want to use my iPad to poke folks and see what things they’ve liked on the social network, I rely on Mobile Safari, accessing the site like any other. 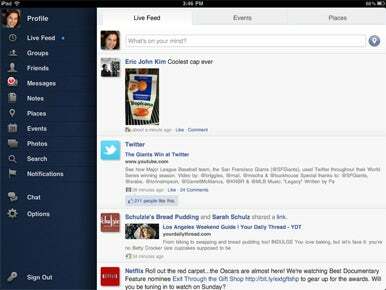 But various developers have attempted to fill Facebook’s iPad-sized void with compatible apps of their own. I’ve already reviewed two iPad Facebook apps, Social ( ) and Facely HD ( ). Both were OK, but neither struck me as measurably better than relying on Safari to surf Facebook. (Social, in fact, seems to have disappeared from the App Store as of this writing.) I took a look at four more Facebook apps, to see if any other competitors could unseat Safari. To do so, the app would need to improve upon the basic Facebook experience that Safari already affords in tangible ways. The first app I checked out was Friended ( ). The app costs just a buck, and is also available in an ad-supported free version called Friended Free. Unlike Social and Facebook Touch, Friended really aims to redefine the multitouch Facebook experience; rather than simply present a skinned version of Facebook’s mobile site for touch screens, the app structures your Facebook data with its own unique approach. In portrait mode, you get your News Feed on the left (with options to navigate between the Live Feed, status updates, links, and more). On the right side are three modules: Recent Pictures, Recent Friends, and Chat. Recent Pictures unsurprisingly displays photos that your friends have uploaded to the site—tapping on any opens up that friend’s recent photos in a popover window. Recent Friends shows the profile photos for buddies who were recently active on the site. The Chat module shows your friends who are currently available for real-time chat, and the popover interface works well. The notifications you receive when your friend replies in chat could be a bit less subtle—a badge appears in the Chat module, and a brief sound is played—but overall, Friended offers my favorite Facebook chatting experience on the iPad. In landscape mode, the News Feed ends up in the center column, with Recent Pictures on the left, and Recent Friends and Chat on the right. Either way, the presentation is clean and well thought-out. I do question the usefulness of the Recent Friends module, but it doesn’t get in the way. Button icons across the top of the app offer quick access to friend requests, messages, notifications, and a compose panel for posting new status updates of your own. The app smartly offers easy access to Groups and Pages, too. In short, Friended is very well designed, and a very pleasing way to navigate Facebook. The same unfortunately can’t be said for MyPad+, which was formerly known as FacePad+. Like Friended, MyPad+ ( ) is a $1 app, with a free, ad-supported variant available. The app uses a two-paned interface, with the left navigation panel offering links to jump between the Live Feed, Groups, Friends, Notifications, and the like. On the right panel, though, MyPad+ generally just displays Web views from Facebook’s mobile touch site for some sections (like Live Feed), and from the regular site for others (like Groups). The result is an unpleasantly inconsistent way to navigate the site, with an app that doesn’t feel very app-like. The native app interface just triggers different Web pages to load on the other side, and the experience really doesn’t gel. MyPad+’s Frankenstein monster approach is only made worse by some design sloppiness. For almost all of the sidebar links, you can tap either the icon (like a little calendar) or the text (“Events”) to load that page. With Chat and Options, however, you may only tap on the icons; tapping the next does nothing. When you do launch chat, it takes over the entire app with a full-screen Web view. In my testing, my list of available friends consistently showed up empty until I exited Chat and re-entered it a second time. Once you’re in Chat, you must scroll your friends list with two fingers. When you return to the main app, the keyboard doesn’t automatically disappear from view—though it should. In short, MyPad+ just isn’t a very good app. It takes Facebook’s touch site and makes it worse. 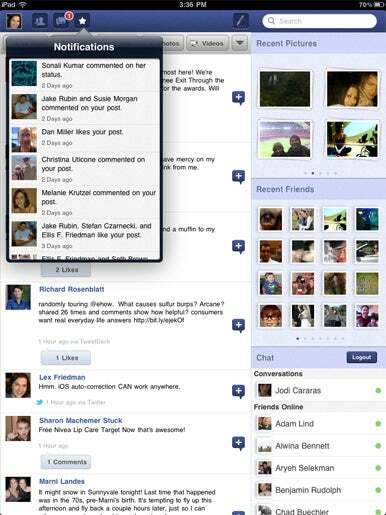 Facebook for iPad with Chat — Pica HD ( ) doesn’t have that problem. Like MyPad+, this $2 app attempts to re-skin Facebook’s mobile touch site—but it does so in a much smarter way. (iPhone and iPod touch owners, note that there’s a $1 iPhone version of Pica as well.) Pica looks very nice. The app sports a handful of themes, though it’s certainly annoying that the app must reload your entire News Feed when you change to a new theme. Rather than create its own interface elements like MyPad+, Pica simply shows the mobile site in its entirety, but with major visual tweaks. You can navigate between Home, Profile, Friends, and Inbox, and there are buttons for accessing search and notifications, too. Because Facebook’s touch site doesn’t yet offer an interface for accessing Groups, though, Pica doesn’t either. Pica’s interface for Chat mirrors MyPad+’s; it employs a full-screen Web view taken directly from Facebook’s mobile interface, without reflecting your chosen theme from the rest of the app. Overall, Pica is a far more visually appealing experience than MyPad+, but is limited to the functionality offered by Facebook’s mobile site. Pica, MyPad+, and Friended all offer the ability to upload photos. 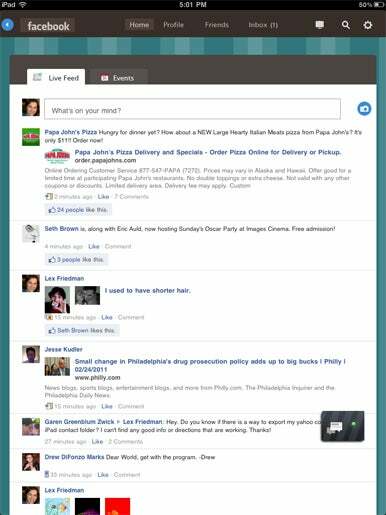 But that functionality is the main focus of iLoader for Facebook HD ( ). iLoader doesn’t help you navigate your Facebook news feed. Its core purpose is to enable you to upload photos and videos from your iPad to Facebook with ease. And if you regularly sync photos to your iPad that you’d like to share on Facebook, it works pretty well—once you become accustomed to its quirks. You choose one or more photos from your photo library. You can then tap into each to add a caption, or to tag the folks in the photo (by two-finger tapping on their heads and then finding their names). Once you’re ready, you press the Upload button. iLoader then prompts you to choose an existing album or create a new one, and then sends your photos straight to Facebook. Video uploading works the same way. Unfortunately, the app was a bit buggy in my tests. When choosing photos to upload, I couldn’t get the popover to close or disappear unless I backed out of the album I was in first and did some random tapping. And the app lets you add the same photo to a single upload batch multiple times, which seems silly. On the plus side, the app also makes it easy to watch your videos (those that you’ve uploaded, along with those that you’ve been tagged in), though it doesn’t make it similarly simple to browse photos. With iPad 2 introducing a camera to Apple’s tablet line, iLoader has become more useful. Still, I upload most photos to Facebook either from my iPhone or from my Mac, so I’m hard-pressed to find a routine way to keep the app in my workflow. The app costs $2, and a free, feature-limited version is available, too. I began my tour of iPad Facebook clients convinced that Mobile Safari would win again—that full access to Facebook’s Website from the iPad would remain my preferred way to poke people and post snarky comments on their walls. In the end, however, my Safari preference ended when I befriended Friended. It smartly uses the iPad’s screen real estate, eliminates ads and other Facebook cruft, and manages to feel more like an app than a Web browser—something none of its competitors can manage to do.